It's been a little while since I've shared any finished makes. I've been busy making more things! 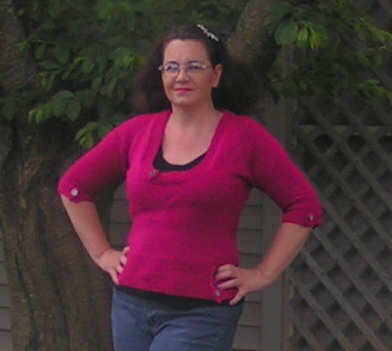 In April, I finished knitting a retro-inspired top called St. Moritz from a book called Knitting It Old School that I've had for a couple of years. I love how the top turned out, except the yarn is too rough to wear next to my skin. It felt fine while I worked with it and the swatch didn't feel bad - and I've used this yarn before in another color and it's great. I guess this bright magenta just wanted to be rough! 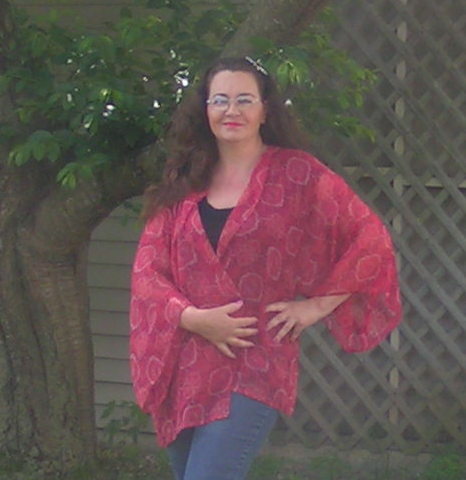 I also finally made a kimono-style jacket. The fabric has been in my stash for decades...and I kind of hate being old enough to say that! But the kimono turned out great. I used a "pattern" from pinterest and every bit of my piece of fabric. I made a sash, too, but forgot to take it out for a picture. 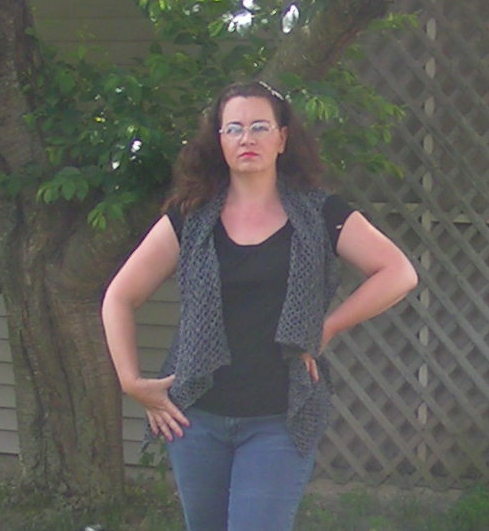 I also recently finished crocheting a drapey vest, also with deep stash. The yarn is from Goodwill, bought when the boy child was a new baby. A local yarn distributor had donated their whole supply. The labels are all in Greek, but I think this yarn is cotton with some nylon for the silvery strands. The one on the left is an experiment - I strung about six feet of seed beads on some silk yarn (thread weight) and held it with a second strand of the silk to crochet a chain. Then I chained that chain with a bigger hook and tied it into a circle. It's really light for how chunky it is. I started it as a ind of prototype for an idea that's been haunting me. Since it turned out so cool my bigger project has been green-lighted. Last week was the anniversary of Marilyn's birthday - she would have been 90 years old. I'm working on a project to celebrate her life - and not just the glamorous movie star part. It's also from stash materials. Since she grew up in the Depression I'm sure she would appreciate and understand why. I've also had Theda Bara on my mind. I recently saw A Fool There Was, I think the only movie she made that still fully exists. It has stuck in my mind for both the beautiful clothes and the content. We still have movies about "bad" women who ruin the men who fall for them. Some things just don't change, do they? Eric borrowed the first season of Game of Thrones from a friend and we've watched about half of it. It's not doing much for me. I know it's hugely popular. I'm not seeing why. I don't like shows that take several episodes to a full season to get "interesting" - I want to like at least one character right away. I also don't care for "bad people are bad, good people are stupid" kinds of stories. I do quite like a new show called Houdini and Doyle that's on Fox. It's a police procedural, like so many shows, but it's main characters are Harry Houdini and Arthur Conan Doyle. I couldn't resist! The main police officer is a beautiful woman who reminds me of Hermione in her logical approach to things. The costumes are gorgeous. It's nice to enjoy a show after so many have crapped out on me. Of course, we're now into the summer television season, so I should maybe look for new stuff. I'm enjoying old movies so much, though, that I forget! I did recently watch The Great Gatsby. Kerry had told me that it's his favorite, so I had to check it out. I love the book and have read it several times (but couldn't find it for him to read, darn it!). It's a beautiful movie. I think it really captured the feeling of the book with the opulence next to the desolation in such a small area. I'd love to find an autographed copy of the DVD for Kerry for Christmas. Maybe I'll be able to save up enough in six months! Okay, I'd better get going. 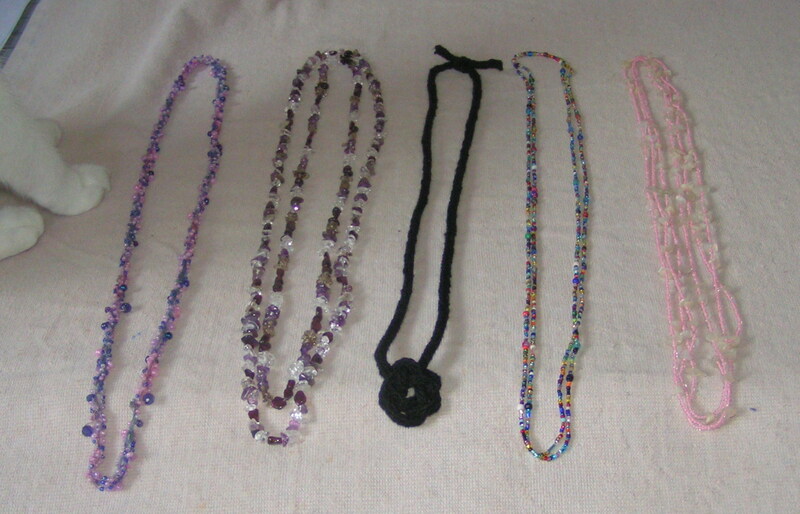 I have work to finish before the lure of the bead stash grabs me again. What will I do when the well runs dry? Oh, I'll think about that another time. See y'all later!